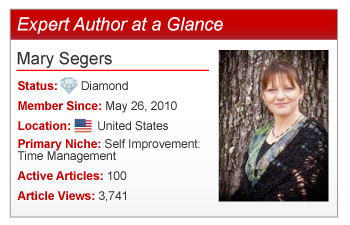 Ask 5 Expert Authors: “What is challenging about article writing?” 4 out of 5 will respond: “Time.” For Expert Author Mary Segers, time is a challenge easily conquered with flexible time management solutions. After receiving her bachelor’s (3.98 GPA) and master’s (3.88 GPA) degrees, Mary noticed that she didn’t suffer from the same ills of her cohorts, e.g. no time for themselves. Following graduate school, Mary decided passing on her unique time management skills could help the world. Setting out with a variety of self-made time management programs, Mary uses her quality articles to reach her audience, broaden exposure, and drive traffic to her time management solutions. Write ideas down to clear your mind and focus. Sit and let your mind wander to the issues that individuals struggle with in your niche. Take a walk and observe people just living their lives and going about their routines. Once every couple of months, spend a few hours writing new article titles. Maintain a spreadsheet and add questions you’ve been asked or you’ve seen asked in forums. Mary’s Solution: I’ve persisted and held my ground. [My 16 year old daughter is] finally getting better at something I’ve been trying to teach her for years (and I do mean YEARS): waiting while I finish up what I’m working on right then. This keeps us both in a better mood and we both get what we want … she gets attention and I get to finish what I’m working on. Mary’s Solution: I finally figured if I was going to be spending the rest of my life writing, I may as well be as comfortable as possible … I control what I can. I make sure everything is as conducive as possible for me being able to concentrate and write. Temperature, lighting, sound, hunger … they are all such easy fixes. Mary’s Solution: When I find something that works for me – whether that’s a location to work, a time to work, a piece of software, or whatever – I try to stick with it. I still like hearing suggestions and I like trying new things, but I’m quick to throw them out if they don’t really work for me. Find what works for you and make sure it fits around your life, your family, and your personality. Notice the word was fits … not forced. Don’t get me wrong … there will be things you need to force (i.e. yourself out of bed, to turn off the TV), but like new shoes, there should be at least some degree of comfort right from the beginning. Listen to your instincts … they aren’t marred by overthinking. Finally, thinking and learning will take you nowhere. Putting action behind that thinking and learning will take you anywhere you want to go. Use Mary’s incredible time management strategies and advice to overcome your own challenges to achieve your article writing goals. We’re ready for you, Mary – bring it on! Do you have a question or comment for Mary? Feel free to leave it in the comments section below. Really enjoyed this and the last article on tips. Thanks for sharing what works for you Mary. I enjoyed having the opportunity to see this article Mary, you practice what you teach. Thank you for the sharing it. Mary these are some incredible solutions for the common article writing road blocks. Your skills speak for themselves in the fact you’ve been selected to get great publicity for your work. Keep writing, because many people can definitely emulate your article writing ideas for themselves. Great wisdom from a wise woman. Thank you, Mary for giving us something of value when it comes to overcoming time theft… procastination…a bad habit hard to break. @All–Home Time Management has always been and will always be something that just fascinates me. But I’m still always looking for ways to improve. Thanks to this clever lady who at least managed to controll her timing. I think time management is a problem to many of us, as usually we don’t stick as we plan. And that delays many of our duties including our writing. Hats off to anyone who is capable to do so. Mary, you are a time manageress indeed, Thanks for the advice. You provided many useful tips here. The one that stands out for me is to make a list of article titles. That can motivate me because I already have the ideas and then the details can percolate in my mind. I also like your suggestion to get comfortable with location, lighting, and food. And then just write. @Zahra–While I’m quite capable I don’t mind admitting that I still (at times) struggle with my own home time management. But with the right mindset comes the right techniques that make it easier to very quickly REGAIN control of life. And I think that’s what makes my life different…I get back on track real quick. I like living a more simplified life. @ Dr Erica–Doesn’t the right environment just make a WORLD of difference? Like me…you have obviously spent many years studying. And I’m sure that you quickly learned…as did I…that the right environment could help or hinder your ability to learn. Why should we not expect those same factors to affect our subsequent endeavors? @Frances–Be glad…that percolation is an ability which is sought-after by many. So…yes, yes, yes…write them down. Take an hour once a week and let your mind run wild. What will happen is that each single topic will naturally spawn several other topics. Soon you’ll have an entire month’s worth of articles…just from letting your mind simmer on a few. I love it! Inspirational. It is amazing when someone is willing to share openly. Mary congrats on the awesome publicity.